February 27, 2018, Barcelona. Allterco Robotics presented its latest IoT developments at the biggest mobile technology event – the Mobile World Congress in Barcelona (MWC). The company has unveiled 3 innovative additions to its product line – the new model of the loved children’s smart watch MyKi Junior and the smart home products Shelly Eye and Shelly Sense. All visitors of the congress, to be held between February 26 and March 1, will be able to test the new devices and convince themselves of their benefits. “At the heart of everything we do is our desire to create unique developments to make people’s lives easier by always striving to raise the bar. This is the idea of our new products. For example, MyKi Junior aims to give parents the peace of mind of always knowing where their children are and to provide children with more freedom. 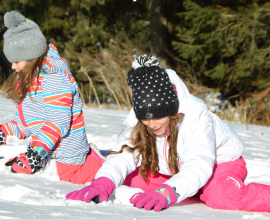 With MyKI Junior we also raise the bar as functions and as a target – the watch is now suitable for teenagers too” – said the CEO of Allterco Robotics, Dimitar Dimitrov. The new MyKi Junior has all the advantages of its predecessors MyKi Watch and MyKi Touch as well as some new extras. The device is the first watch that allows video conversations between the child and the parent. The chat feature also allows users to send both voice and text messages as well as pictures and emoticons. In addition, MyKi Junior is the only smart children’s watch on the market that offers a connection between all children holders of MyKi. All small users of the watch will be able to connect to each other, both by calls and by messages. The watch also has useful applications like calculator and activity tracker. For the first time, there are several built-in games, as the play time can be controlled by the parent via MyKi Watch mobile app. The new MyKi Junior will be available in three color combinations – yellow-red, blue-green and black-red. Separately in MyKi Junior users will discover all features of the other MyKi models – MyKi Watch and MyKi Touch. 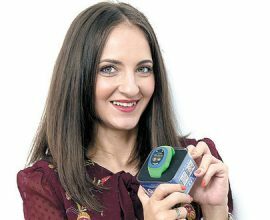 The devices work with a SIM card and enable parents to connect with their children at any time and track their location through the free mobile application MyKi Watch. The location is detected through up to 24 satellites, Wi-Fi and LBS. All MyKi watches serve as GPS, GSM, and watches, and help parents feel calmer about the safety of their loved kids. MyKi Watch can make calls to 10 numbers, while MyKi Touch and MyKi Junior – to 20 numbers, which are pre-set by the parent through the app, also the devices can send voice messages and receive text messages. A great advantage of MyKi models is that parents can set up “safety zones” which their child usually goes to. For example, if the child should be at school from 8 am to 12 pm, but he/she is not, MyKi is notifying the parent. The watch also has an SOS button that the child can use to connect with a parent in case of emergency. 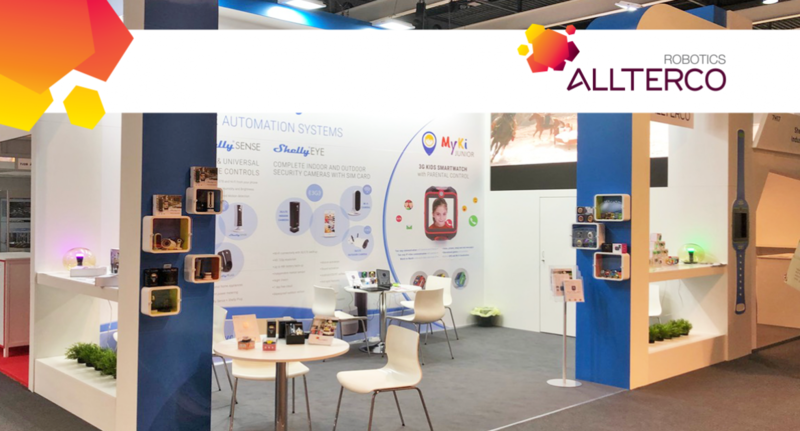 Exclusively at MWC 2018, Allterco Robotics will also demonstrate the latest IoT solutions from its Shelly home automation product line. These are the smart devices Shelly EYE and Shelly Sense that care for the comfort and safety not only of your home but also of the office. Shelly EYE is a completely wireless smart camera that allows users to monitor everything that happens in their home through a special mobile application. Thanks to the built-in, precise technology, the product sends notifications and HD video to your smartphone as soon as it detects movement, thus providing 24/7 control over what’s happening in your home. Shelly EYE detects sound signals and transmits video of good quality even in the dark, thanks to its infrared technology of latest generation. The videos are saved for free in a Cloud for 168 hours, giving users time to watch them at a convenient time and no matter where they are. The camera has a 3G modem and battery as well as an SD memory card slot. This, along with its compact design, distinguishes it from competitors’ products on the market. Shelly Sense is an indispensable helper for every home. The device is a smart sensor that accurately records and sends information about light, heat, and movement directly to your mobile phone, so you will always be aware of the microenvironment in your home and you will be able to manage it along with the other Shelly products. Visitors to the World Mobile Congress 2018 will have the chance to personally test all the new devices at the Allterco Robotics stand (7J16 stand, Hall 7) and get acquainted with the company’s extensive range of innovative, smart products.